Here are some things that i think are a must for a programmer (php in my case) and are not implemented or not user friendly at all. 1. No proper hints for function autocomplete. For example, when I write the starting letters of a function, hit ctrl+space for autocomplete, the dropdown with multiple possibilities appears. So far the only possibility to see some details of what each function in this dropdown actually does is to hit ctrl+q and to activate the documentation. Seems rather frustrating to hit multiple times in order to see a simple hint.. my advice is a hint row should be put under the dropdown to display a @desc for each option (see PhpEd). 2. No proper hints for function parameters. Basically you want to call a function and when you get to write the parameters… the only hint you are given is the param name used in that function, nothing about what type of parameter it should be. It would be indicated that in front of each parameter name it's type to be dispalyed. Moreover, I write a function, for example doSomething(), and if i put my cursor inside the brackets and hit ctrl+space to get some auto suggestions, I should get a list of the expected parameters that my function requires, not some not needed variables. I'm hitting auto suggestion inside the function to get a hint of what parameters i need to fill in, no others should be displayed instead of the ones my function requires. 3. A vast majority of php programmers use the help function (F1 or any other shortcut key) on a function to open an internal web browser with the help from php.net. Hope ot see these features in the final release. I created feature request http://youtrack.jetbrains.net/issue/WI-1418?query=reformat . Please vote. Go to Editor -> Code Completion and check 'Show full signatures' (see screeenshot below). As I know, appropriate bug in bugtracker was closed with resolution "Won't fix." Thanks for the reply, but i think that 1 is already implemented. 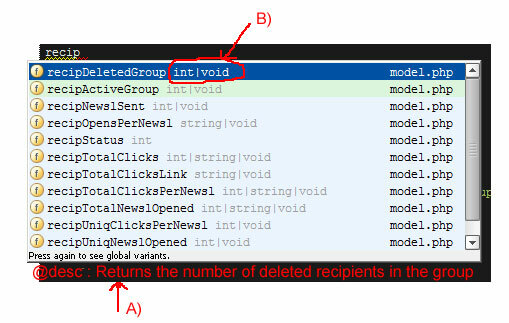 It's Code completion -> autopopup documentation in (ms). Set it to 0 and it will show immediately. I was reffering more at the possibility to see a description of that function (taken from @desc) somewhere in the code completion dropdown. A. This is what I would expect. Better & simpler way of browsing your functions and having a description under the dropdown or incorporated in the dropdown. Having the documentation opened aside of the code completion dropdown means a big window with lots of text in, nothing i would require when i'm just deciding what function to pick from the dropdown. Should be simple and straight forward, thus a @desc under the dropdown would fit nice. If i require further details of that function, I will open the documentation, but not when i'm just browsing. So, my question is, where from are those types inserted there and can I change them? Regarding 3. (A vast majority of php programmers use the help function (F1 or any other shortcut key) on a function to open an internal web browser with the help from php.net.). Is there any way to set-up external help or any other types of help?